Look. It’s simple: I like the spooky, the party and the candy. Nemo doesn’t. Halloween is taking off big time in Australia, and while I am getting a little dizzy in the shops with all.that.stuff on offer, I am really fine with people having a good time, dressing up and being scary. I have grown up with a similar tradition in Europe, we had a lot of fun as kids, too. So yes, we will be the dark house on the street. And I am fine with that, too. That’s all. Just keep that in mind. Some people won’t be doing Halloween and won’t be stocking tons of candy for your kids either, for all kinds of reasons. And it shouldn’t be a big deal. 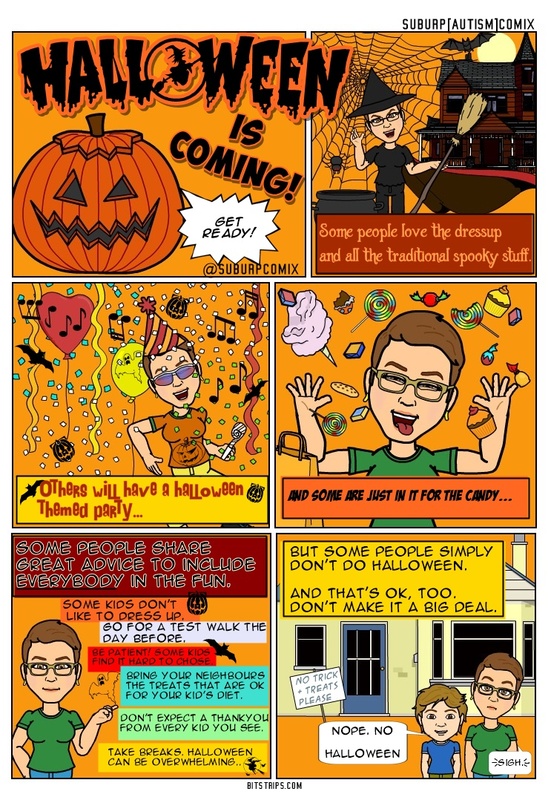 This entry was posted in general and tagged acceptance, ASD, autism, dressup, halloween, peer pressure, spooky on October 27, 2014 by starfish. So it’s April and I almost didn’t post with my own pc now a warranty case, but it’s a BUZZ out there, April is ON in the autism “community” and I had a couple of strips prepared. So here. It’s April and ‘awareness’ is in the air… you ‘aware’ yet, everybody ? AUTISM is HERE!! Look, I get it. Calling for awareness is good to draw attention to something, even sometimes, it helps raise funds, but for many adult autistics it has become the red cloth Autism Speaks is wiggling in front of them (although, really, the date of the 2nd April for World Autism Awareness goes back to the UN – 1989! and no blue lights either..) and every do-gooder and click-activist who makes themselves feel better by sharing a post here or there, or dutifully awing and owing at beautifully blue lit monuments. So ‘aware’, one day of the year. Well, dear ‘awareness people’ it’s been 25 years. I think we could really move on to ACCEPTANCE… And yes, that’s so big we need the WHOLE MONTH OF APRIL. April. Autism Advocacy, Acceptance and all.. you aware of this?